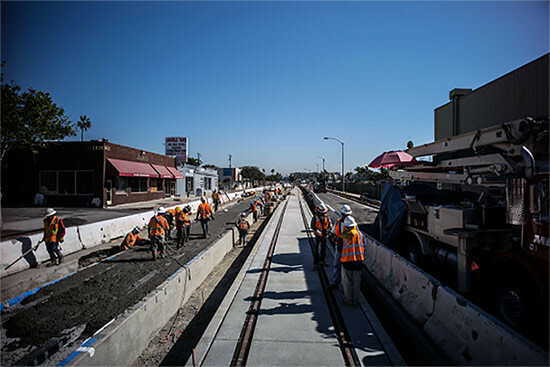 The 2.35-acre buffer park—named after local World War II veteran George Haruyoshi Ishihara and commissioned by the City of Santa Monica—is built on a slight 110-foot-by-55-foot space set aside during construction of a new maintenance facility servicing Metro's Expo Line fleet. 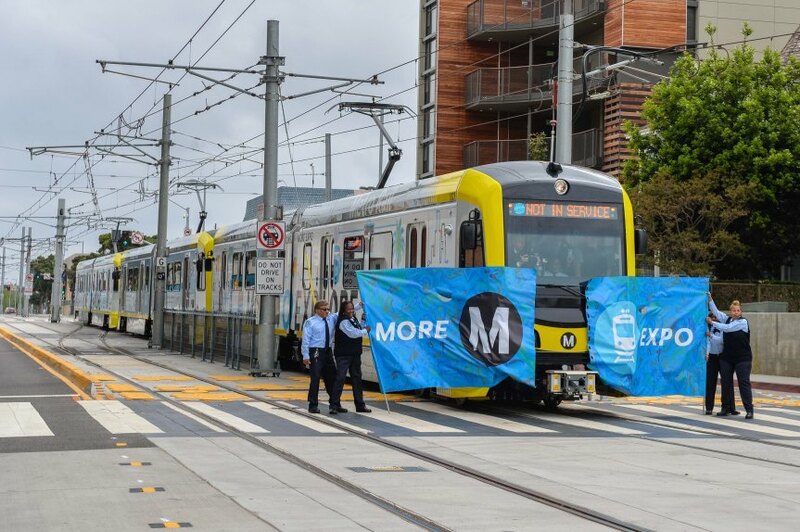 Los Angeles’s newly completed Expo Line extension creates the first rail connection between Downtown and the Pacific coast in almost 60 years. An east-west route linking residential and employment centers at either end, the line represents an opportunity to change the characteristically low-rise region by enabling a 15.2-mile-long spine of mixed-use development. In the four years since the first spur of the Expo opened, developers have begun to wake to the untapped market for transit-oriented development along the corridor, signaling a shift not only in the ways in which Angelenos get to and from work, but where and how they live their lives beyond business hours. Now that the line has been completed, development along the western length of the corridor has sped up. Because of the transit-oriented nature of Expo-adjacent sites, designers must juggle multiple urban considerations such as density, parking, and pedestrian access. 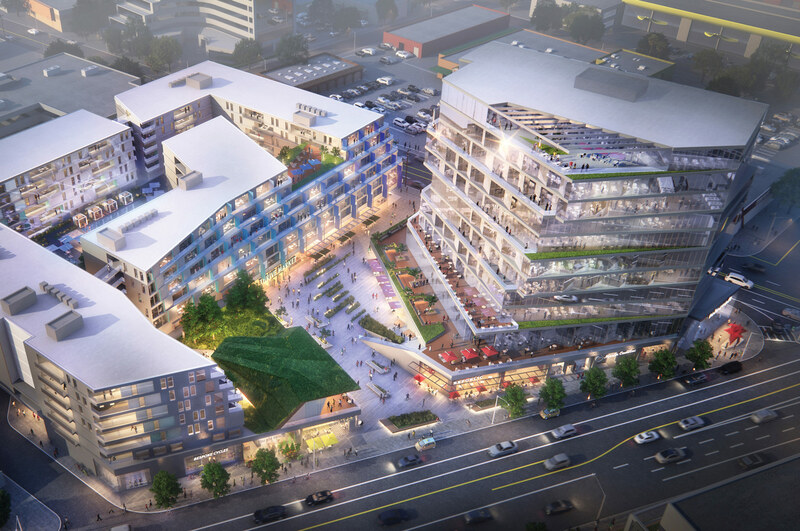 The following projects, all still under design and permitting, emphasize mixed-use configurations, offer an array of unit types, including affordable apartments, and are connected by generous, public open spaces. Our trip down the Expo begins in Culver City, the former terminus of the line, where developers Lowe Enterprises, AECOM, and Cunningham Group have designed the 5.2-acre Ivy Station complex. The new development will sit on a current park-and-ride lot for the Expo Line and contain 200 apartments, a 150-room hotel, 200,000 square feet of offices, 75,000 square feet of ground-floor commercial space, and 1,600 parking spaces, with 300 spots reserved for transit riders. The wedge-shaped site offers an office complex designed by Ehrlich Yanai Rhee Chaney Architects, who also serve as architects of record for that portion of the project, and a retail block along Venice Boulevard, with a multiarmed courtyard apartment complex sandwiched between it and the hotel at the eastern end of the site. Since completion of the master plan by Cunningham Group, Killefer Flammang Architects has taken over the project’s design documentation through the development’s completion. 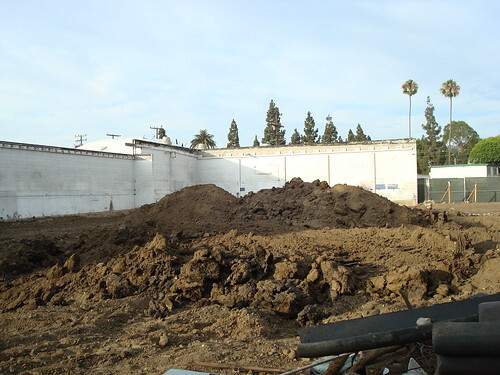 Landscape architects Melendrez also provided site and landscape design services for the project. On its southwest corner, the site hosts a transit stop as well as a paseo bounded along its perimeter by porous ground floor connections, including colonnades and heroic staircases. The buildings have stepped and sharply angled facades, with each of the glazed office and retail floors bound by terraces. Meanwhile, the apartments and hotel are clad in modular metal sheathing articulated as coursed masonry or geometric panels, for the apartments and hotel, respectively. Renderings showcase red floor plates and structural walls in the office and retail areas with carved out loggia and projecting balconies along the facades of the apartment blocks. The 4.76-acre Martin Expo Town Center development at the Bundy Station further west is located on the current site of the Martin Automotive Group’s Cadillac dealership. Gensler, with landscape design by Rios Clementi Hale Studios, designed a terraced, 10-story, 160-foot tower containing 200,000 square feet of creative office spaces at the corner of the site, jaggedly staggering back and forth across its height, creating variable outdoor spaces accessible from the offices within. A mid-block paseo below is flanked by 99,000 square feet of commercial space, including a proposed 50,000-square-foot grocery store. The site’s 516 mixed-income residences are organized in a similarly terraced, seven-story perimeter block formation, with residences directly overlooking either the paseo or an interior courtyard. The complex will feature 192 studio, 181 one-bedroom, 137 two-bedroom, and six three-bedroom units. Of the total, 20 percent of residences will be affordable, with three-fourths of those affordable units operating as workforce housing and the remainder consisting of “very low income” units. “We wanted to design this project as a model transit development for L.A. by combining two things that have historically been perceived to be incompatible [here]: desirability and density,” Gensler’s design director for the project, Tom Perkins, said. “We are planning for multimodal access—including bus, metro, automobile, bicycle, and pedestrian—in order to connect with the neighborhood and create an active outdoor environment surrounded by new retail, residential, and office uses that attract local residents, office workers, and transit users.” As a part of this multimodal effort, the complex features parking stalls that are “decoupled” from the apartment units, allowing apartment dwellers to opt into renting a parking spot if they own an automobile while opening more parking spots for transit users. At the western terminus of the Expo Line in Santa Monica, two notable projects apiece by Koning Eizenberg Architects and Michael W. Folonis Architects aim to bring a variety of multifamily configurations to the coast. Koning Eizenberg Architects’ 84-foot-talldevelopment, 500 Broadway, features 249 market-rate residences and is organized as a bundled quartet of buildings connected by 35,000 square feet of ground-floor commercial space. The building features generously fenestrated and bifurcated facades, with louvered siding and simple, stucco walls alternating along courtyard faces. An unzipped, rumpled facade made up of extruded floor plates, canted walls, and corner windows marks the project’s northwest-facing front along Broadway. The development is notable for its commitment to exceeding the city’s affordable housing requirements, providing 64 deed-restricted affordable units around the corner at 1626 Lincoln Boulevard. This five-story structure will rent entirely to households earning 30 to 60 percent of the area median income (AMI). Owners of the complex preferred an off-site location for affordable units to better provide support services for residents, like after-school tutoring and healthcare. Also, the off-site location allows for more affordable units to be built overall, since integrating as many affordable units within a market-rate complex would have been impeded by height limitations imposed on 500 Broadway’s site. 1626 Lincoln consists of 17 three-bedroom apartments, 18 two-bedroom apartments, and 29 one-bedroom apartments, and features simply rendered massing that incorporates a mix of punched windows and doors across expanses of stucco walls with storefront glazing along the ground floor. Michael W. Folonis Architects (MWFA) is working on two mixed-income projects that also push the envelope in terms of urban program and form. MWFA’s Lincoln Collection, a 90-unit, mixed-income complex featuring 13,000 square feet of ground-floor retail space, is organized as a tight mass of apartment blocks connected by exterior circulation. The complex will have 18 affordable units, half of which will be set aside for households making 80 percent or less of the regional AMI, while the remaining nine affordable units are for those earning less than 50 percent of the AMI. The building’s white stucco facade is chopped up by inset, and sometimes interlocking, balconies. Walls along recessed areas are clad in blond wood or glass, as is the ceiling of a triple-height corner loggia space supported by a massive Y-column. The apartments themselves are organized around a central courtyard with a swimming pool and other leisure areas. This balcony-lined courtyard allows the building to utilize natural ventilation for individual units, while also providing an interior urban condition that is uncommon for L.A.
by the designers, who, by removing more building mass than typical step-backs require, have arrived at a provocative method for embedding traditionally urban frontage in a community where development is highly contentious. “We thought we were going to have a huge fight on our hands,but [city officials] were very enthusiastic about it and encouraged us,” Folonis said. The project contains 64 units, 13 of which are affordable, and includes a mix of unit types that look out onto the complexly articulated, carved-out courtyard. These projects are among the first to make their way through planning and permitting phases since the Expo opened. 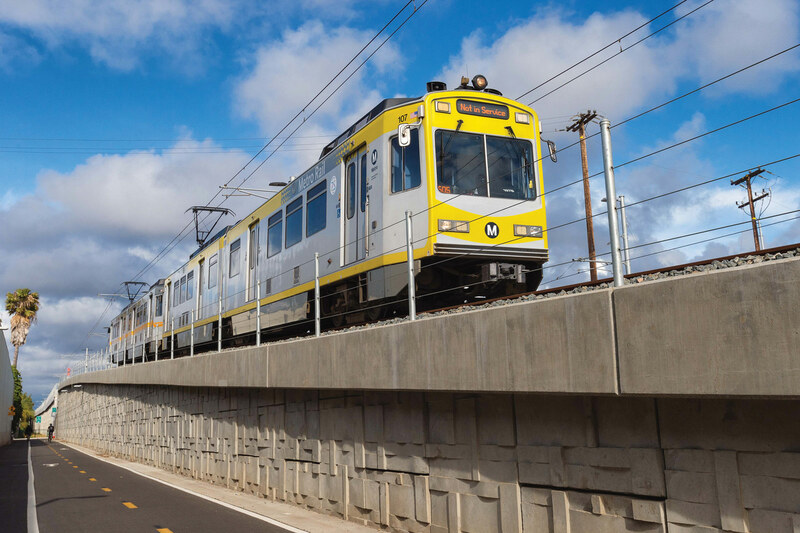 Though with early ridership estimates already surpassing projections, it is likely that L.A.’s new transit corridor will soon be home to many more residents and workers. There’s been a lot of sunny news revolving around the incoming Expo Line in Santa Monica, which is scheduled to open sometime in 2016. But with all the feverish construction, it appears some unwelcome guests are coming out of the shadows (or actually, the ground). Several businesses around the construction—including those of architects—are reporting increased numbers of cockroaches making their way into their offices. Some have even called it an infestation. Who knew mass transit would attract such a wide ridership? 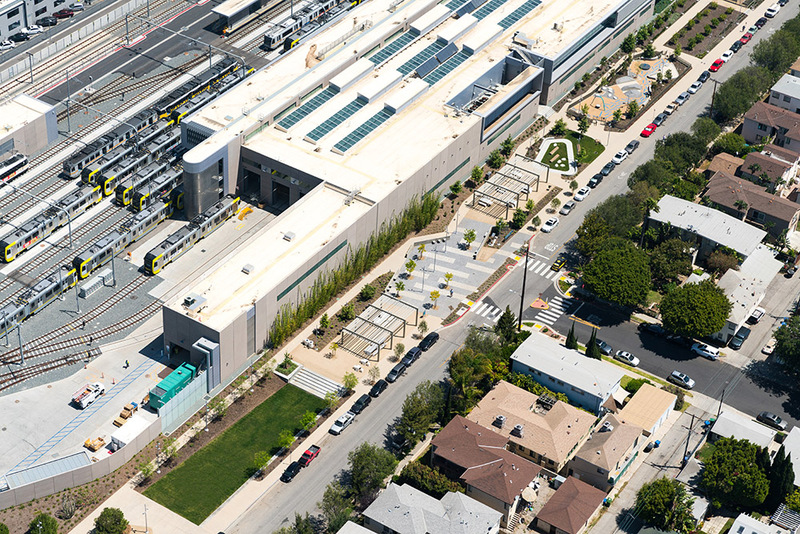 Our friends at Morphosis just moved into an interim location (as posted on their website) at 3440 Wesley Street in Culver City. The firm has been hesitant to give many details about their upcoming space, a former commercial building right next door that they say they are remodeling, merely stating that it will “be sustainable” and “bring back the integration of the shop with the studio space.” But when we checked out the location we were surprised to find the approximately 13,000 square foot building razed except for the north and east walls. No one mentioned that they were constructing a new building! Of course, it could still be a ‘remodel’ because they didn’t completely destroy the building. The site has been cleared and whatever interior restraints had existed are now gone. So who knows what really is going to pop up here? It’s a key location next to the new Exposition Rail Line (going from downtown to Culver City), putting it in the heart of the pedestrian and commuter traffic that will follow after the rail line’s completion. Our contact at Morphosis stated they are hoping to be complete with the space by the end of the year or early in 2011.